On May 31st, 1980, Gallagher’s Canyon Golf Club opened its doors to the public with the stunning par 72, 18-hole Championship Canyon course. Framed by forested mountains, rocky bluffs, tall ponderosa pine trees and overlooking Gallagher’s Canyon, this Les Furber & Bill Robinson designed course is sure to challenge golfers of all abilities. Known to be rugged yet refined, the Canyon course offers the quintessential Okanagan experience and consistently proves why so many call this region ‘home’. Fast forward 35 years where Gallagher’s Canyon Golf Club has evolved into an all-encompassing destination, offering the 18-hole Canyon Course, 9-hole Pinnacle course, double-ended practice facility, Canyon Bar & Grill and outdoor Wedding Ceremony Site with stunning views of the picturesque Canyon. The 2015 season will serve up a variety of 35th Anniversary Promotions, including: golf for $35, and a 35-minute lesson with a GBC Golf Academy Pro for $35. 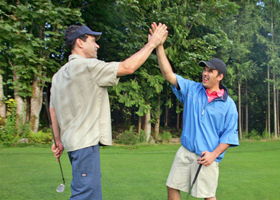 For full details on our current promotions or to book a tee time, click here or phone the Golf Shop at 250-861-4240. For Membership inquiries, please contact Peter Hopley (General Manager) and for Wedding, Event and Golf Tournament inquiries, please contact Melina Moran (Sales, Marketing & Event Manager). Gallagher’s Canyon: minutes from the city, surrounded by nature. Article in the Capital News, June 4, 1980.